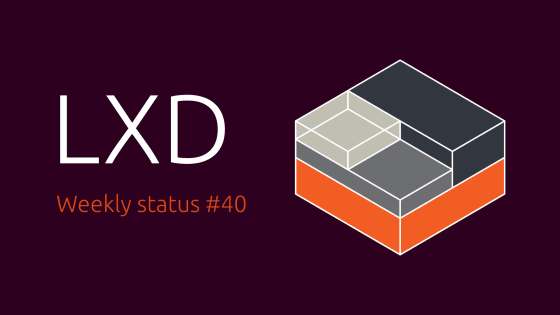 This week we released another LXD beta and two LXC betas. We also made good progress replacing the command line parser in LXD, finishing the port of the lxd command line tool with only lxc left to port at this point. Remote copy and move of storage volume was completed and merged in LXD, as was the addition of a new lifecycle event class and a number of improvements to the clustering code. We’re expecting the final release of all projects to happen this week, with components getting tagged as they’re considered ready. Release announcements will be published as we finish writing them. Added proper support for moving CEPH backed containers in LXD cluster. Ported the lxd command to the cobra parser. Made Operation and RemoteOperation interfaces in the client. Fixed transactions when querying the database. Added new lifecycle events to the events API. Re-organized some of the storage migration code. Fixed forwarding of log messages to the events API1. Switched to the new dqlite/sqlite cluster API. Fixed importing images by URL. Added support to remotely copy and move storage volumes. Added tests for push and relay volume migration modes. Fixed container migration code to transfer snapshot timestamps. Fixed some ignored errors in the database code. Renamed some functions inside the lxc-net script. Removed leading whitespace from log entries. Fixed missing symbols in the PAM module. Fixed dhclient hook when AppArmor is active. Fixed the container config not getting truncated on save. Simplified some of the autodev code. Fixed dumpable flag when calling hooks. Changed default name and description to use the mapped architecture. Export the kernel architecture, kernel personality and mapped architecture separately. Fixed a typo in variable names. Replaced some calls to Fprintf with equivalent Fprintln. Added support for Fedora and the dnf package manager. LXD 3.0.0~beta6-0ubuntu1 was uploaded, following the upstream release. LXC 3.0.0~beta2-0ubuntu1 was uploaded, following the upstream release. LXC 3.0.0~beta3-0ubuntu1 was uploaded, following the upstream release. Updated for newer sqlite version. The beta channel was updated to LXD 3.0.0.beta6.